This ratchet tie down strap is an update of traditional tie downs that makes loading and unloading easier and safer. It self-adjusts to keep tension so webbing won’t loosen and get tangled (or jammed), and it retracts for neater storage between jobs. 1500 lbs. Breakstrength: Includes 12 ft of webbing, Work load limit: 500 lbs. 4500 lbs. Breakstrength: Includes 15 ft of webbing, Work load limit: 1500 lbs. Dimensions: 1500 lbs. 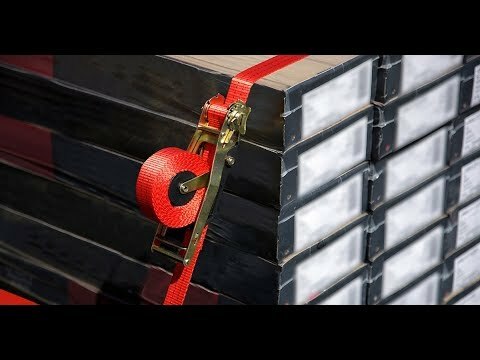 Breakstrength: 2.75" x 7.2" x 4.4"; 4500 lbs. Breakstrength: 3.2" x 8.8" x 5.4"
Weight: 1500 lbs. Breakstrength: 1.65 lbs. ; 4500 lbs. Breakstrength: 3.3 lbs. Stereotypically, my husband uses this and likes it a lot. MY HUSBAND LOVED THESE RATCHET TIE DOWN STRAPS. HE SAID THEY WERE VERY EASY TO USE AND STORE. If you’ve ever used a tie down, you probably know that there’s room for improvement with the traditional tool. Quickloader is just that. It’s a ratchet tie down strap that makes moving loads easier and safer thanks to its self-adjusting recoil feature. When you tighten the straps, the locking mechanism provides an added measure of safety and prevents the webbing from coming loose. The extra-large steel handle gives hands a safer distance from the ratcheting mechanism, and gives you better leverage to crank it. 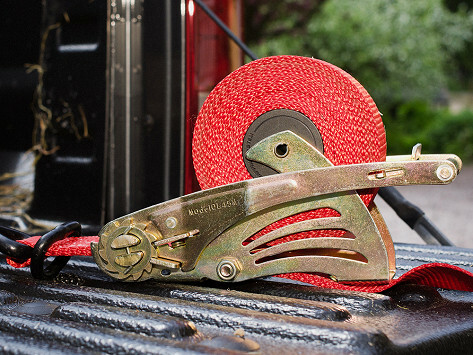 When you’re done, Quickloader retracts the webbing to store neatly—no knots or tangles—for the next job.